After a couple of days’ rest, we left the Homewood in St. 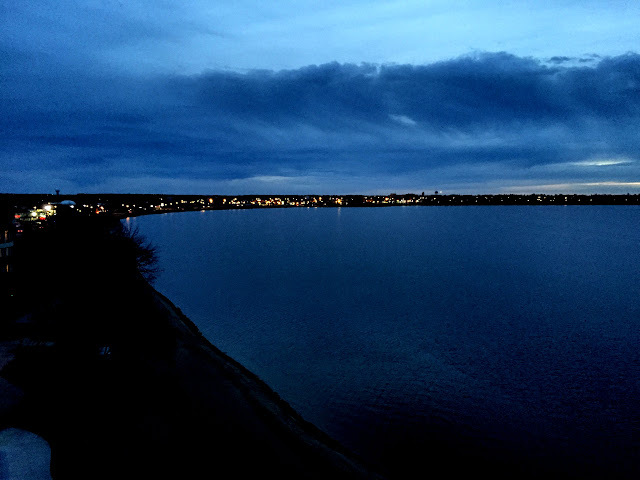 Cloud at 7:30 this morning with the goal of following the Great River Road as it meanders from one back road to another trying to follow the course of the Mississippi River in its serpentine path through Minnesota. The pale blue sky with its wispy clouds and a brisk temperature in the mid-40s offered no resistance to our plan. 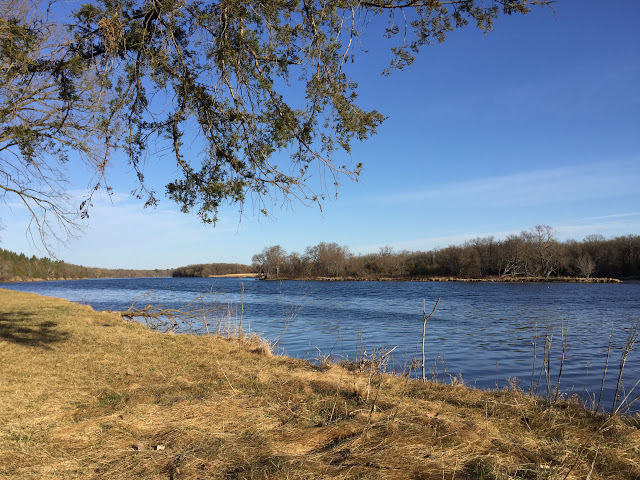 In northern Stearns County, we stopped briefly at the Mississippi River County Park to get a glimpse of the river. It was of about medium size there, not nearly as wide as it grows downstream, nor as narrow as we expect it to be near its source. 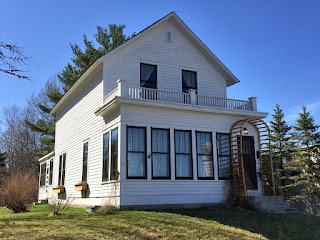 The Great River Road led us through considerable farmland—some small farms, others much larger but broken up with occasional stands of hardwoods interspersed with some cedars and pines. Barns in the area tend to have steeply pitched roofs, the better to slough off snow. Uncultivated fields hosted a healthy assortment of prairie grasses. At times, the river hugged the road but only briefly before it skittered away again. It flows around numerous small uninhabited, tree-covered islands. Often the GRR crosses the river and continues on the opposite side. Just south of Little Falls, we stopped at Charles Lindbergh State Park and Historic Site, but it was not opened for the season yet. 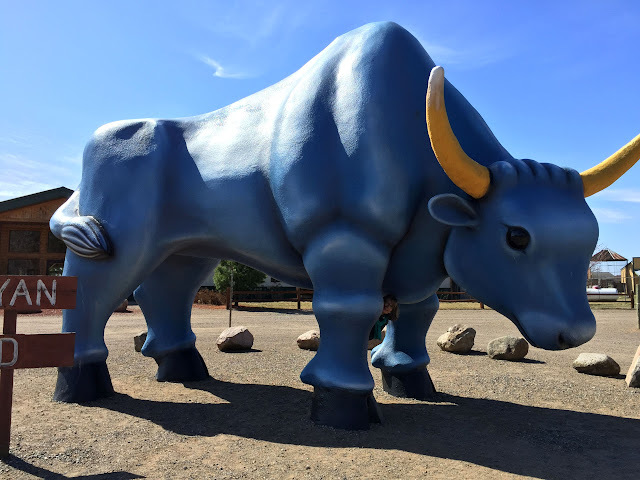 We wanted to walk around and check out the interpretive signs near the house, but clouds of hungry mosquitoes swarmed at the car doors when we stopped, so we thought better of disembarking and decided to move on. From the safe confines of the car, we stopped in Little Falls and took a look at the dam that replaced the waterfall that gave the town its name. 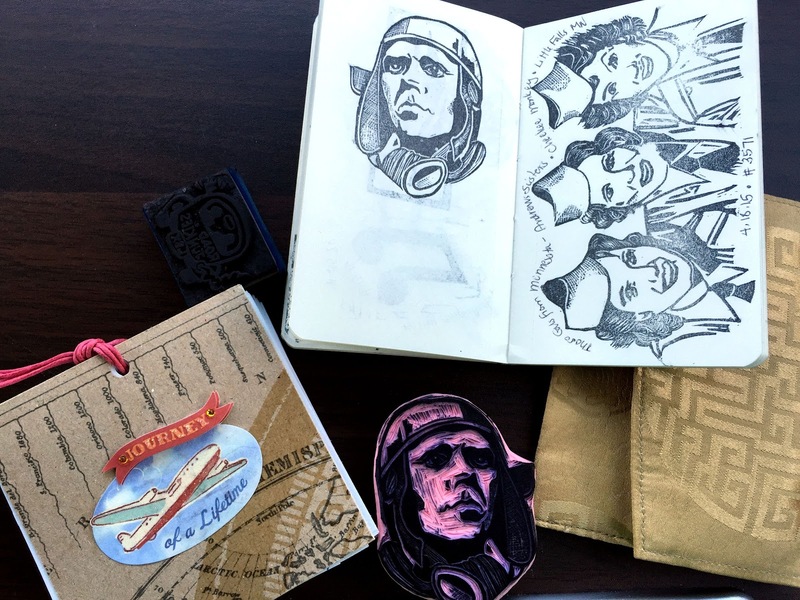 But even the skeeters couldn’t keep us away from a couple of brilliant letterboxes by Cheekee Monkey in the local Oakland Cemetery—one honoring Lindbergh, who spent his boyhood summers in this area, and the other commemorating the singing Andrews Sisters, who were natives of Minnesota. 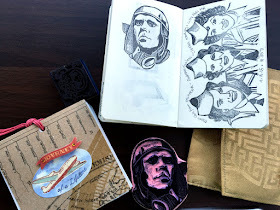 As we have come to expect from this Tennessee letterboxer, the stamps were detailed and precise and the logbooks cleverly crafted to fit the theme. About six miles south of Brainerd on MN-371, we paused at the Brainerd Lakes Welcome Center. Within a fifty-mile radius of Brainerd, more than 500 glacial lakes dot the land—or if you’re a fan of tall tales, the lakes began as indentations left by the footsteps of Paul Bunyan’s ox Babe. Paul was greeting visitors to the center, though we thought he might have shrunk a bit. Nevertheless, another Cheekee Monkey letterbox nearby offered a terrific stamp with Paul’s likeness. Continuing into town, we saw Paul’s flashlight in the center of town. 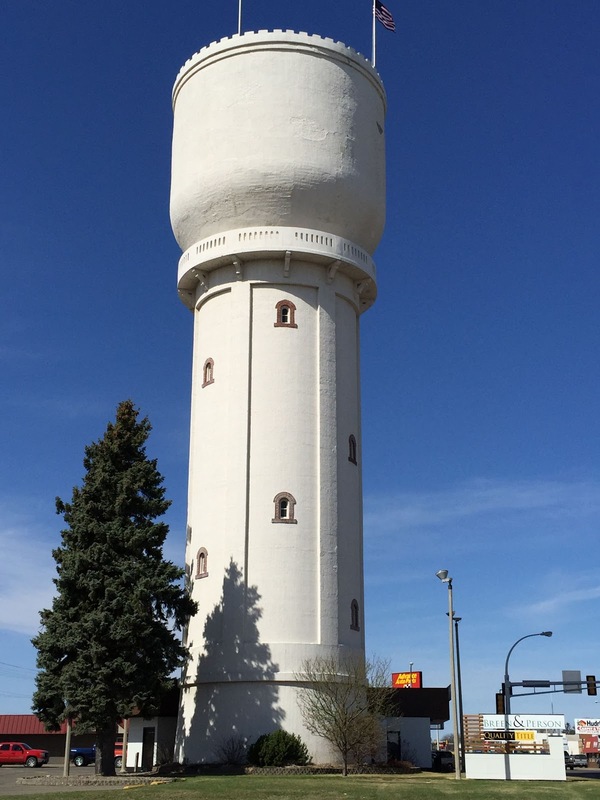 Locals had apparently removed the inner workings and were using it as a water tower. 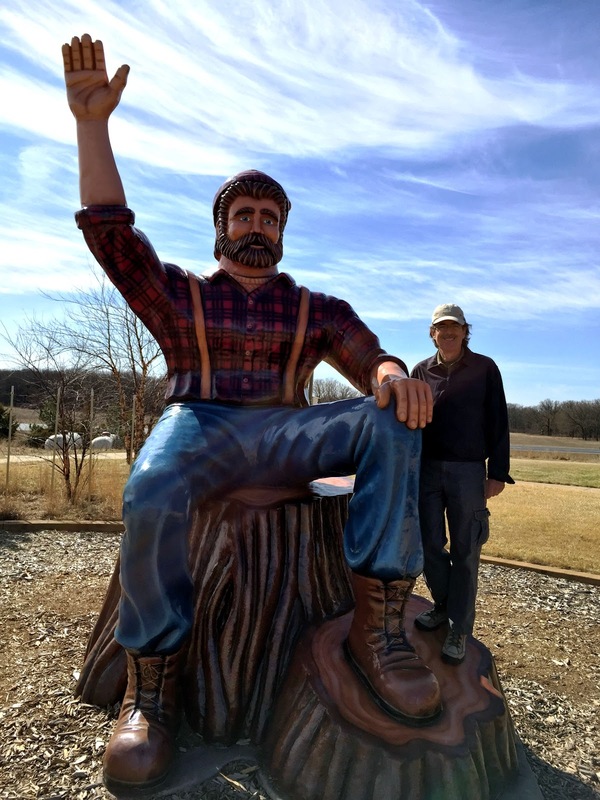 We had definitely arrived in Paul Bunyan country and couldn’t resist the opportunity to drive a few miles east of town to check out a 27-ft. robotic lumberjack. Sadly, when we arrived, we discovered that Paul had been locked away in a 30-ft. shed at Paul Bunyan Land for the winter. He’s not due out until Memorial Day, but Babe, who apparently is adaptable to all kinds of weather, stood guard over the parking area. He advised that we return to the Great River Road toward Bemidji, and we agreed. As we continued on the scenic route, with our eyes constantly peeled for the GRR signs so we’d know when and where to turn, we finally realized that the route has special hashmarks on our GPS map—subtle and unlabeled, but definitely for that purpose and very helpful. 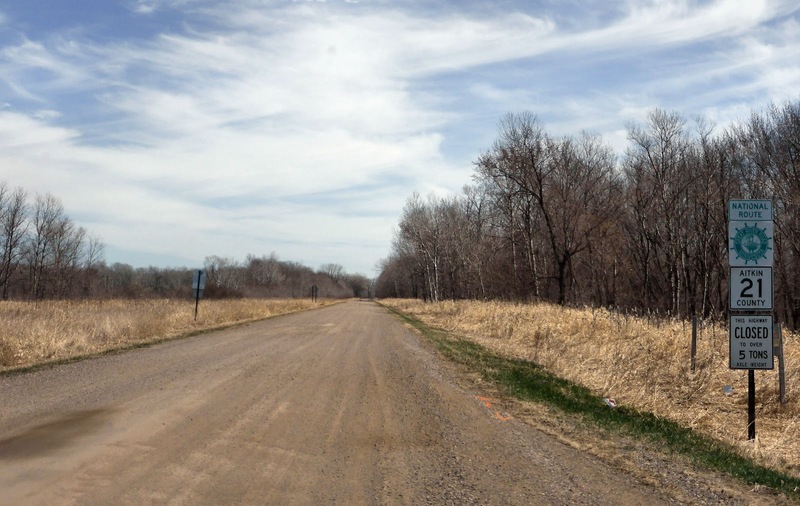 Following the river, the road curved and wound between Merrifield and Crosby in Crow Wing County. 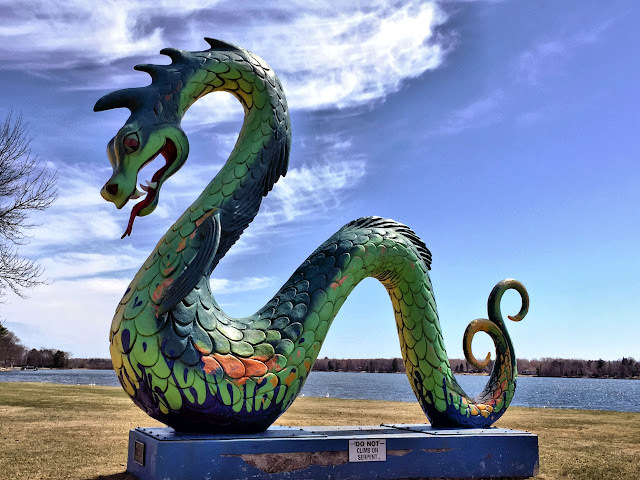 Along the way we paused to photograph a couple of roadside attractions in Crosby (the Serpent Lake serpent) and Deerwood (a large leaping deer). 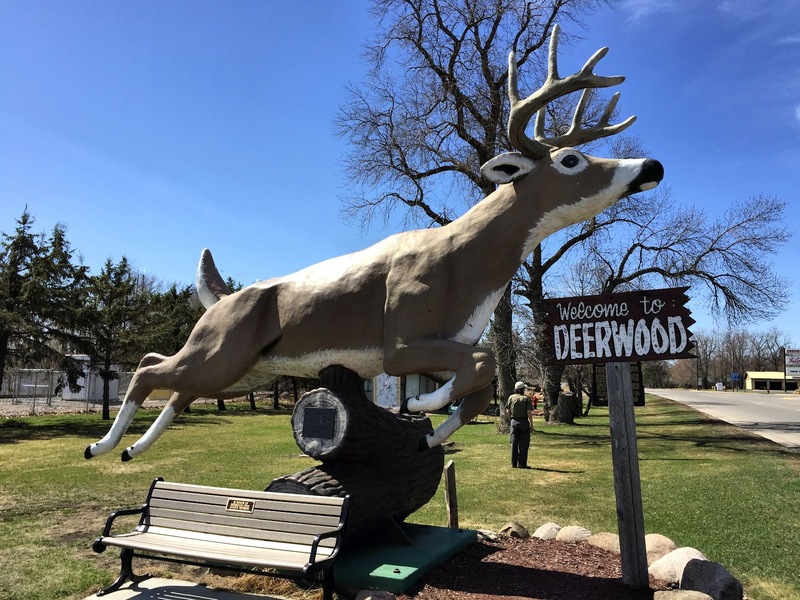 From Deerwood, we continued to Aitkin on the busy MN-210, well away from the river. Following the GRR back across the river outside Aitkin (crossing #12 for today), we were on CR-1, which soon turned to a gravel track. Following the river as it squirmed through the lakes area, we went from pavement to gravel and back again, with a long stretch of gravel through Aitkin County until we reached the little town of Palisade (pop. 167). We thought we might try the well-reviewed Palisade Cafe, but it looked a bit too much like a meat and two with no vegetarian options, so we drove on. 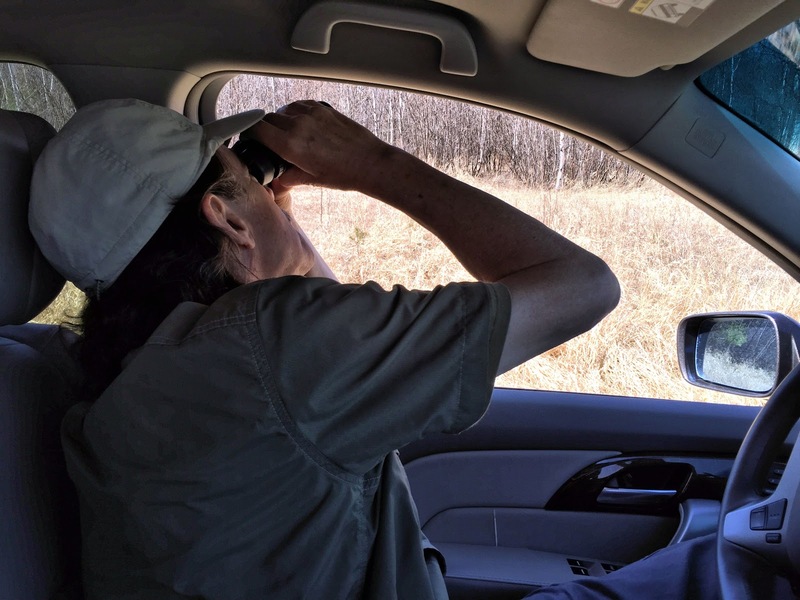 A few miles north of Palisade on CR-10, Ken abruptly stopped the car, claiming to have seen a rare—very, very rare—Minnesota koala near the top of a tree. Retracing our route a few hundred yards, we found a safe place to pull over along the roadside and pulled out the binoculars. There was no denying it. 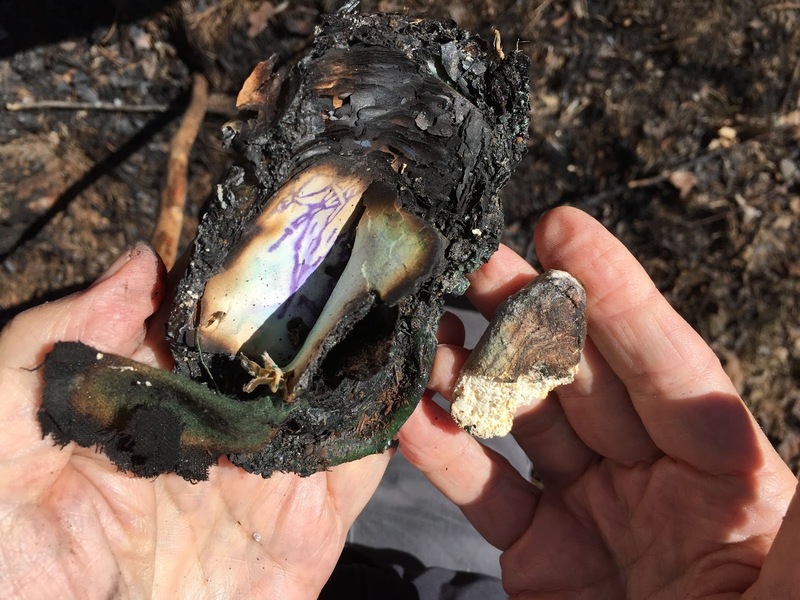 The way the animal was braced on a limb about 60 feet high in a tree munching on leaves did bear an uncanny resemblance to the cuddly marsupials we saw in Australia last fall. From a distance it did. With assistance from our binoculars, however, and a bit of Googling, we finally concluded that we were looking at a woodchuck enjoying some of the first new sprouts of spring. He would bite off a small twig, eat the leaves off it, and chuck the twig to the ground. Thus, the question of whether a woodchuck could chuck wood was finally resolved. How much wood he could chuck remains a mystery. Our next stop was in Grand Rapids (pop. 10,869), where we checked out a small museum dedicated to a local girl named Frances Ethel Gumm. Born to a husband and wife vaudeville team in 1922, Frances lived the first four years of her life in Grand Rapids. It was there at the age of 2 ½ that she first performed on stage, singing “Jingle Bells” with her older sisters in a Christmas show. The town treasures its brief ties with this tragic singer and actress who later adopted the stage name Judy Garland. Their Wizard of Oz/Judy Garland Birthplace Museum boasts the world’s largest collection of Judy Garland memorabilia. 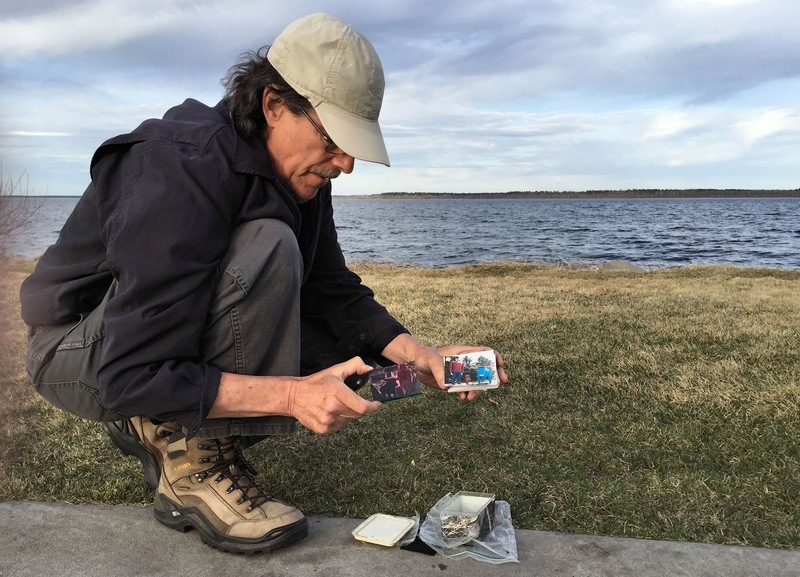 When I asked in the museum whether any of her relatives still lived in the area, the ticket agent did not know, though she did report that a babysitter’s family is still around. 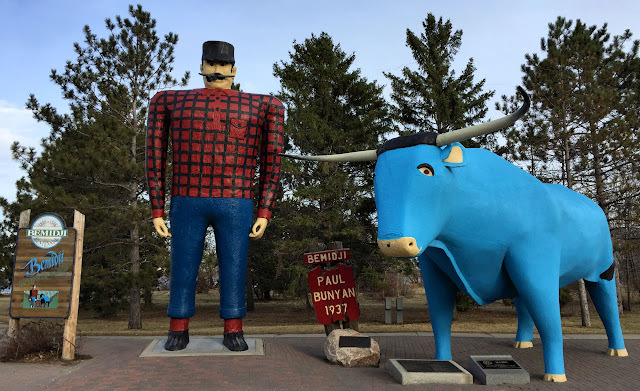 Without the opportunity to greet some genuine Gumms, we continued on our way toward Bemidji on US-2, stopping only briefly for some photo ops of roadside attractions, like Paul Bunyan’s Adirondack chair in Grand Rapids and the Big Fish Restaurant in Bena. When we arrived at the Doubletree in Bemidji, we were treated to an upgrade on the lake side of the hotel. Tutto Bene, a local Italian eatery recommended by the hotel staff, turned out to be quite good. We ended this long but satisfying day sipping a glass of wine on our lakeview balcony as we watched the moon rise. Tomorrow we’ll drive about 35 miles west to finally see the headwaters of the Mississippi River. Paul's flashlight in use as Brainerd water tower. It can't be a koala! 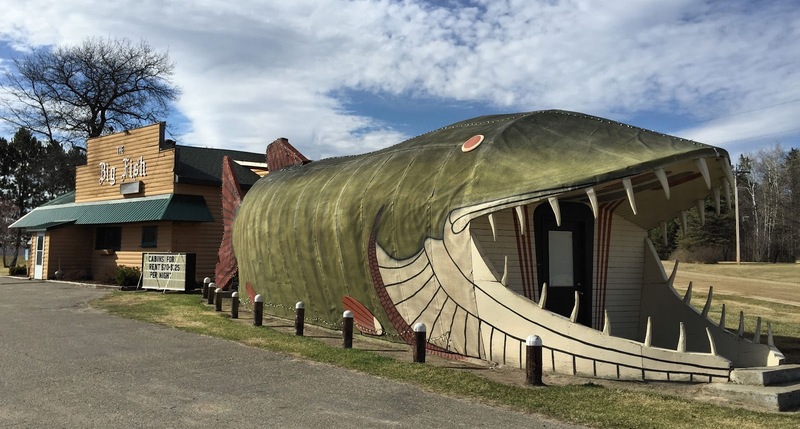 Big Fish restaurant near Bena. Eat or be eaten!